[In the mail today I got my copy of this month’s G Magazine (Green Living Made Easy), featuring a Yes/No opinion piece on nuclear power. The “Yes” was provided by yours truly, and it was great to see the name Decarbonise SA in print for the very first time! My 400 words are to be found below. The “No” position was handled by David Noonan of the Australian Conservation Foundation. This is one of Australia’s most prominent environmental organisations that has been responsible for some wonderful work and advocacy over the years. But sadly it maintains an opposition to nuclear power. The opposition flies in the face of evidence of its safety and, more troublingly, evidence that climate change is slipping quickly out of our control. I have to conclude that the opposition has become ideological and cultural in such organisations and will be very difficult to address. Prior to Fukushima, Australia had among the world’s highest per capita greenhouse gas emissions. We were casting about for a solution to our fossil fuel dependence, hoping a grab bag of efficiency measures, investments in renewables and pricing of greenhouse pollution would somehow shut down fossil fuel power stations. This was failing. Globally the march to climate catastrophe was continuing with a forecast doubling of energy demand by mid-century. The growth in energy consumption was critical to help the world’s poor move to a better existence. But the energy was being delivered by coal that killed people in great numbers from accidents and horrible air pollution, while driving up greenhouse gas emissions. The quake and tsunami have been and gone. Fukushima is past the crisis point but remains unresolved. Crucially though, nothing else has changed. The problems are no less urgent. The alternative solutions are no more adequate. That gives Australians a choice between two fundamental pathways. The first is to absorb the fear that Fukushima generated and maintain the status quo, being outright rejection of nuclear power. Make no mistake; whether intended or not, that means maintaining a greenhouse gas intensive energy sector. The fossil fuel giants will breathe a sigh of relief. They know the only credible risk to their dominance is nuclear power. While Australia has abundant renewable energy resources, abundance is only part of the puzzle. Even if abundant, when energy sources are diffuse, intermittent and location specific, like wind and solar, it is very difficult to catch, store, and move energy to where and when you need it. They work, but not to the scale we need. The second pathway means discussing the missing ingredient for decarbonising our economy; nuclear power. This super-concentrated energy source generates no greenhouse gas or other air pollution. It provides fully 15% of global electricity generation, in 29 countries, including the 16 largest economies (excluding Australia at number 13). Its fearful reputation bears practically no resemblance to its un-matched safety record. Australia has a clean slate for nuclear power, allowing us to move straight to Generation III+ reactors that benefit from 40 years of design improvements compared to Fukushima. We can lead the introduction of Generation IV technology that consumes nuclear waste as fuel, spelling the end of fossil fuels forever. 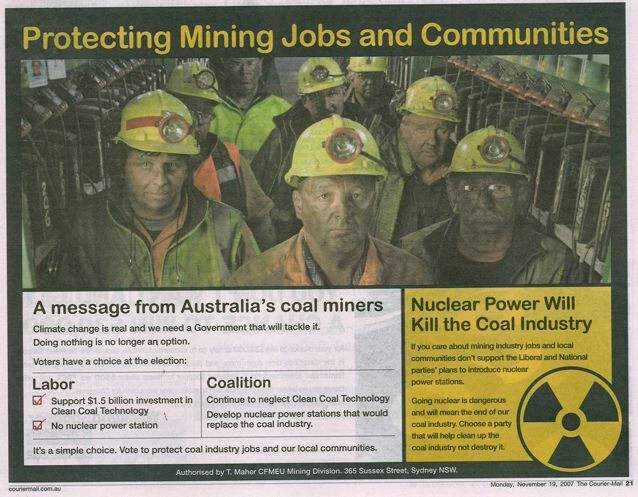 A strategy built around modern nuclear power, renewable energy and energy efficiency, each deployed as their advantages and disadvantages dictate, can deliver what has eluded us so far; a prosperous Australia with dramatically reduced greenhouse gas emissions. Previous Entry Can we please just get honest and say the n-word? I asked him a pretty pointed question in a debate setting once where he showed a surprising willingness to cherry pick a single line from a whole book (Prescription for the Planet by Tom Blees), quote it well out of context to a roomful of people and make a terribly false inference. It was a pivotal moment for me in my journey from opponent of nuclear power to proponent. Oh! I remember listening to just such an exchange, on a podcast I think. It was an NP debate between Blees and Brook, and Noonan and Diesendorf. I remember being pleased when someone from the audience picked up on that and pushed Noonan to put the quote into context. So that was you Ben? To think, I witnessed the turn around! You know, just the fact that the pro side for nuclear power is still making it into green publications, gives me hope that at least some everyday-environmentalists rate effective action on climate change ahead of being an member of the old guard anti-nuclear movement. Maybe the fact that climate change is still a real and urgent problem will be enough to keep nuclear power on the table. As you point out, an industrial scale accident, be it nuclear, hydro, or even geothermal does not change the fact that intermittent renewables are going to need some serious support in decarbonising anywhere. Once again Ben, a great post. Thanks Marion. It was indeed me! Glad you appreciated it. I listened to that podcast too at the time. That was a dirty fight, and turned very ugly. The way Noonan put his case struck me as essentially dishonest. Transparently so, making Brook and Blees all the more credible. Yes, and that is a crucial point for me. It is our presentation and demeanour, as much as our facts, that will bring people to our way of thinking. More slowly than fear-mongering, but it makes for a very permanent shift, as in my case. Brook and Blees came away looking very good that night. The ACF has indeed done good service in many areas of conservation as have the affiliated state bodies,in my case,the QCC. Unfortunately,a lot of these organizations,which have some eminently sensible people active in them,have been captured to some degree by the professional people they employ.Noonan is probably one of these.They are really politicians clad in green.They are not backward in pushing their private agenda through the prestige of their position. I saw this first hand at the last Walk Against Warming in Brisbane.Toby Hutcheon,the executive director of the QCC,used the occasion to deliver an emotive diatribe against nuclear power.He was suported by the actor Jack Thomson – quite appropriate,I thought. 1) I can’t really stand G Magazine, it’s consumerism wrapped up in pretty ethical wrapping paper for the concerned upper middle classes. Give me Grassroots or ReNew any day (though they’d never have a policy debate about nuclear power, they’re dangerously naïve, and don’t really do policy). 2) 400 words isn’t much – did you nail it? Partly, IMHO, but you were too soft, too nice, didn’t slam down the facts in the way I would like, didn’t give a sense of urgency, a sense of danger. But I’m not a communications professional. 3) Overall the ACF have been a reasonable force for good. In this one particular area though, they along with the Green Party, are Big Carbon’s “useful idiots”. Are there any substantial conservation groups in favour of nuclear power? I’d agree with points 1) and 2) (and don’t know anything about ACF, so can’t comment on 3). I tried G Magazine for a while but very quickly gave up on it when I realised it was mainly advertising for wishy-washy feel-good products (bamboo chairs and the like) and had nothing to say on substantive issues. For me the important point made in the 400 words was the GenIV and waste reuse, but it could have been stressed a bit more (then again 400 words is a very small number, and I doubt I’d get anything across within that limit!). From my perspective, the one point that has stopped most anti-nuclear people in their tracks when I’m discussing nuclear with them is the GenIV and waste reuse….especially when you explain to them that this includes both reusing their own waste in a closed fuel loop, but also in using up the exisiting waste the anti-nuclear side always bring up in their “Ah-ha, but what about all the waste! ?” attempt to stop the discussion. Not only do we get emission free power, at the same time we’re cleaning up the waste they seem so concerned about right now…. Ah, everyone’s a critic… You know, the hard part is I have no idea whether you are right or not. I’m not peering over the shoulder of every G-magazine reader to gauge their reaction. But I guess I should explain what I am trying to do. Let’s say 100 people read the column. Say I took a “slam down the facts” approach and did a really good job of it, and 70 of those people went away agreeing with me. That’s a good outcome. Thing is, I don’t really think it’s sustainable. Meaning the next time those 70 people hear David Noonan “slam down the facts”, 50 will change their mind back again, and 20 will put it down to “Duelling experts, who know’s who’s right? Too hard”. I’m trying to do something different. I am going for a deeper level here, where the reader will take the messages really to heart and realise something bigger is at play. I hope that if 100 people read the column, even if only 10 agree with me, of those 10 they all really, really agree with me and realise something is wrong. They have been inoculated from the type of fear-mongering peddled by David and his ilk, so that the next time he “slams down the facts”, they cross their arms and say “we deserve better than that”. At least five of them take some kind of action about it, maybe subscribing here. I will take those 10 people and then those 5 people every single day and twice on Sunday ahead of the 70. Now, am I right??? I have absolutely no freaking idea. Let’s hope so because until I have evidence either way, I don’t plan to change. That said, within about 3 weeks I hope to have a 2 minute animated video finished with Barry. Maybe that will grab the 70 and hold them? Sorry, didn’t mean to imply that you were doing a bad job, or that having a piece in G was a waste of time….I am fully behind what you are doing here and think you’re doing a good job of it 🙂 My comment was intended as constuctive, apologies if it didn’t come across that way….and with the GenIV stuff I just wanted to highlight something that I have found to make anti-nuclear people actually stop and think. Oh, no worries! I was actually meant to reply to Wilful whose comment was just above yours (You will see that my reply is a pretty direct reflection of his comment)! Wilful is a good mate of mine of many years, so we aren’t shy with each other. In general, the reason I want subscribers is so that people do give feedback and help me do a better job. So keep it coming!!! The Gen IV definitely does stop people in their tracks. Cheers, and no hard feelings. Sorry if you got a suprise. Someone like Jim Green exemplifies the problem pointed to by Podargus. Green has been employed for many years by Friends of the Earth as an anti-nuclear campaigner. For the likes of them to change their position on nuclear energy at this point is to admit entire professional careers (Green) and hundreds of thousands of dollars (FoE) have been not merely wasted, but actually done harm to the planet. That’s a very bitter pill to swallow, which is why I’m betting that it won’t be. Can’t believe you brought up Jim Green! I have very direct experience there. The subject of an upcoming post. Stay tuned. I confronted Noonan at the anti-nuclear tent at Womadelaide a few yearas ago and challenged him with a few facts about the current state of the world nuclear power generating industry. He couldn’t handle the truth and finally said “I don’t have to listen to this. You go away and listen to the music.” I walked away with a big smile on my face. The truth hurts for those who have not yet made friends with reality. I too have been trying to share the advantages of Gen IV versions when discussing the need to move to Nuclear. The thing is I’m not aware of any Gen IV plants that are online and operating now. Does anyone have any updated information to mine and has a specific example of an operating Gen IV at the moment and whether they are actually using waste to fuel the reactor? I’d like to be a little more solid when debating with others. Hi Lucy, and welcome to the comments. The Argonne National Labaratory in the United States proved the concept and operated a reactor for some time until the ’90s until the project was cancelled. Today there is the Chinese Experimental Fast Reactor (CEFR) which is very small and as the name says, experimental. Otherwise, the first commercial reactor looks like it will be in India. It is being constructed now (when I say “it”, I believe they are constructing 6 of them), called the Prototype Fast Breeder Reactor. This is what you are looking for, and you can read about it here http://en.wikipedia.org/wiki/Prototype_Fast_Breeder_Reactor . It will run on U238 (“waste” uranium), and is expected to be complete before the end of the year. The technology is just entering the “real world” now, and like all new things there will be a few prototypes and lessons along the way before the boom. Hope that helps. Keep up the conversation, Generation IV is not a myth!!! While there are no underlying reasons why Gen IV reactors wont work, there’s still some way to go in getting them up and running at commercial scales. However most “pro nuke, anti climate change” people think that Gen 3+ is good enough for the next decade, we can hope for Gen IV soon enough but Gen 3 still delivers safety at a reasonable price. Gen IV gets rid of the waste, that’s it’s big advantage. I’m sure I read that the Soviet Union ran a prototype Gen IV reactor for decades. Can’t find it with lazy search (wikipedia), but the BN-600 is a fast breeder that has been in operation since 1980, while the BN-350 ran from the 70s to the 90s. The distinction between fast breeder and Gen IV is admittedly lost on me. Fast Breeder and Gen IV? Interesting question. I understand the fast breeder capability (consumes waste, breeds usable fuel) is the defining charateristic of Gen IV. There are a few other characteristics that set Gen IV apart from Gen III(+). One is that the fuel is a metal rather than a ceramic. This makes it much safer because it gets rid of heat more easily, and expands with heat, which releases too many neutrons and shuts down the reaction in the event of a cooling failure (did thay sound convincing? Still learning) . So while a Gen III+ has passive safety, I guess this passive safety is yet more reliable. Another is that the coolant is liquid metal (sodium) rather than water. Again this makes it safer because the thermal conductivity is much better, and also because it is run at far lower pressure than a light water reactor. Those differences, but especially the breeding capability, seem to earn it the right to qualify as a whole new generation of technology. I was at that debate where you questioned Noonan on his mis-quoting of Tom Blees. Remember it well! It was a pretty dirty debate – I was already well and truly in the nuclear-is-required-to-decarbonise camp, but if I wasn’t I sure as hell would have been after! Thank god for Tom Blees’ wicked sense of humour, which lightened things up a bit. Wasn’t Blees a classic? There is a line in his book that comes out of nowhere about John Kerry, I nearly dropped the book laughing. That question of mine… I had intended to make it a doozy, but I am amazed at how many people remember it. It obviously had the desired effect!